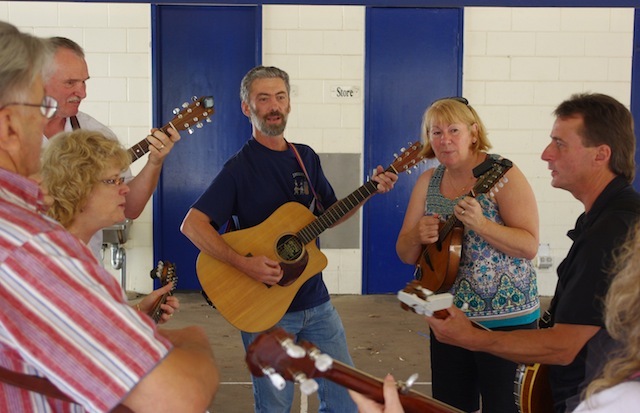 If you are in the Adelaide Region and play bluegrass there is a slow jam session on the First Sunday of the Month at: Semaphore RSL Club, 10 Semaphore Road, Semaphore, SA. The Next Jam Session is: Sunday, May 5th, from 2:00pm to 4:30pm. Got a bluegrass song you want to lead? You are most welcome to sing and lead songs at these sessions. To request: A free online Bluegrass Sunday Sessions Song Book that contains a number of tunes we play, or to have a friend subscribed to this Adelaide Bluegrass Slow Jam Session Newsletter please email Michael Murphy at admin@anterohr.com.au. or call him on 0427 601 517. For those in South Australia here is a new jam session well under way and enjoying good success. If you have been there in the past, or know of someone in the Adelaide Region that plays a bluegrass related instrument (sorry, no drummers) that wants to join in. The Jam Session is at: Semaphore RSL Club, 10 Semaphore Road, Semaphore. A gold coin donation, which goes to directly support the RSL with returning service men and women, is kindly appreciated. The event even has a regular set list which allows you to swat up before hand. To request a free on-line Bluegrass Sunday Sessions Song Book that contains a number of tunes we play, or to have a friend subscribed to this Adelaide Bluegrass Slow Jam Session Newsletter please email Michael Murphy at admin@anterohr.com.au. The first Sunday of each month from 2:00pm to 4:30pm at Semaphore RSL SA. Last year we announced a slow jam session happening in Melbourne resulting from the regular work we do through Jam Camps Australia. Now another regular student from those jam camps has initiated a slow jam in Semaphore South Australia. If you have a bluegrass related instrument (sorry drummers), and you want to slow jam bluegrass style with a friendly beginner to intermediate group where there is no pressure, then feel free to join them. All you need to do is to be able to change smoothly between G, C, D, and A chords. They plan to play and sing a wide variety of bluegrass standards and other bluegrass style songs. Free songbooks will be made available along the way. The first bluegrass slow jam session commences Sunday April 1st at 2:00. Just rock up or call in advance for a songbook. For further information contact Michael Murphy on 0427 601 517. 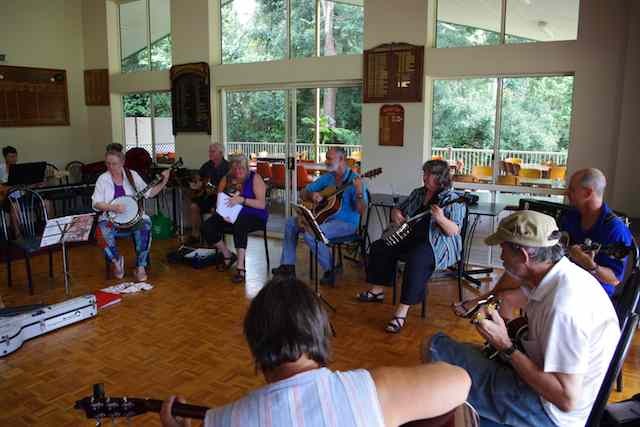 After a busy Christmas there is no more relaxing way to celebrate the start of the new year than sitting down with friends and fellow pickers to play some music – that is if you play bluegrass music. For those in the Melbourne area the first slow jam for 2018 will be Sun afternoon 21st Jan 2018. These slow jams kicked off in July 2015 and are hosted by Mike Clark of Doncaster in Melbourne. 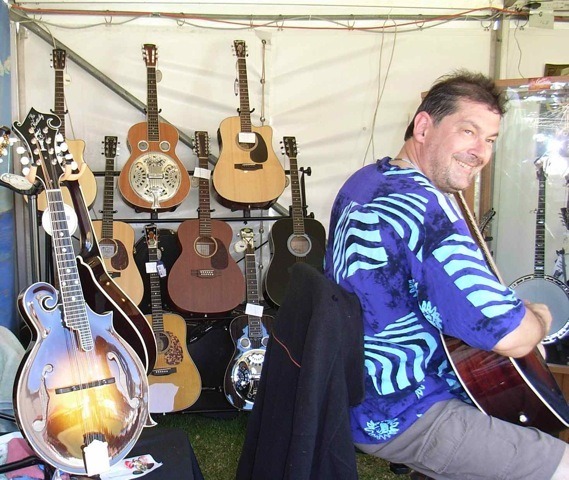 Mike was inspired by the 2015 Wernick Jam Camp he attended in Forrest Victoria that year and has organised for like-minded musicians starting out on their jam exploits to meet on a monthly basis and play bluegrass music together. The first jam attracted five people including Mike and have continued ever since. If you’d like to attend, you can contact Mike using the contact form below. He will notify you of the location and time of this months jam and future jams. The Riverview jam is held every Tuesday evening at the Riverview Inn, Sandy Bay Road, Hobart, from 7.30pm til 10.00pm and has been running about 2 1/2 years now. It was started by Scott Wilson on bass and vocals and Roslyn Wilson on mandolin and vocals. They’re a couple who live in the Yukon, but they spend a good part of the Canadian winter in Tasmania. Scott ran it initially, but when he and Roslyn go back home, Dennis Murphy takes over. The jam attracts guitars, banjos, mandos, fiddles, harmonicas, double bases, drums, accordions, singers and the odd kazoo player. The numbers vary from week to week. It tends to slow down a bit over wintertime. They’ve had 25+ players in the summer and moved the jam to the courtyard out back to make room for everyone (and give the diners inside some space). During winter, the jam is moved to the main dining area of the bar, where there’s a wood fire. There is usually a small audience of regulars at the bar along with whatever diners come in to eat. Organisers tell us that it is pretty much all jamming, but very casual. They have a few books of songs with lyrics and chords from which they pick some bluegrass standards such the, Will the Circle be Unbroken, Cripple Creek, Foggy Mtn Breakdown, Oh Susannah etc.) and a few Johnny Cash, Hank Williams, Bob Dylan, CCR, thrown in. But if someone has a special tune or song they want to do, that’s cool, everyone will shut up and listen. Like most bluegrass jams, they do a lot of 3-chord songs in the key of G. Anyone is welcome to join in and have a go. There’s no cost to attend, except just buy your own drinks/munchies from the bar. Every Tuesday evening at the Riverview Inn, Sandy Bay Road, Hobart. New Jam Sessions for Fitzroy. Here’s some news from Gerry Hale about a new jam session that has commenced in Fitzroy in Melbourne. 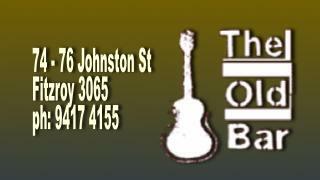 Gerry tells us that he will be running a weekly jam/gig at The Old Bar in Johnston St in Fitzroy every Monday until the end of Oct 2012 from 8.30pm to 11.30pm. It’s very close to his music shop. Uncle Bill will be the host band initially but he eventually hopes to hand it over to various other people when established. There is also the possibility of including overseas visitors when in town to play. The North Brisbane Jam (Hills Bluegrass) is now held in a different building although remains on the same complex. We have changed the description on our regular jams page and added directions as it is harder to find than the old location. The Brisbane North is held on the first and third Tuesday of each month at 7.30pm in “The Cubby” building in the grounds of Hills Church, 79 Queens Road, Everton Hills. To access, drive into the parking area, proceed down the hill, take the first turn to the right and park near the main church complex. Walk past the administration building, past the toilets and through to the prefab building (“The Cubby”). Monday 3rd October 2011. Folks in Melbourne will be pleased to learn that the Guitar Gallery’s successful Bluegrassy Session is now a regular event which occurs on the first Monday night of each month in Melbourne. It is hosted by the Guitar Gallery’s Gerry Hale and Kim Wheeler. The venue is the Old Bar at 74-76 Johnston St, Fitzroy and it starts at 8pm. All players are welcome, as well as onlookers and friends. Here’s a reminder from Terry Cook of the bluegrass jam session to be held at Pelican Waters Bowls Club in Queensland, this Sunday 16th October. 1pm until 5:00pm. The venue is located at 49 Nelson St. Golden Beach 4551 Queensland. All are welcome to come along and enjoy the music, there is no charge. 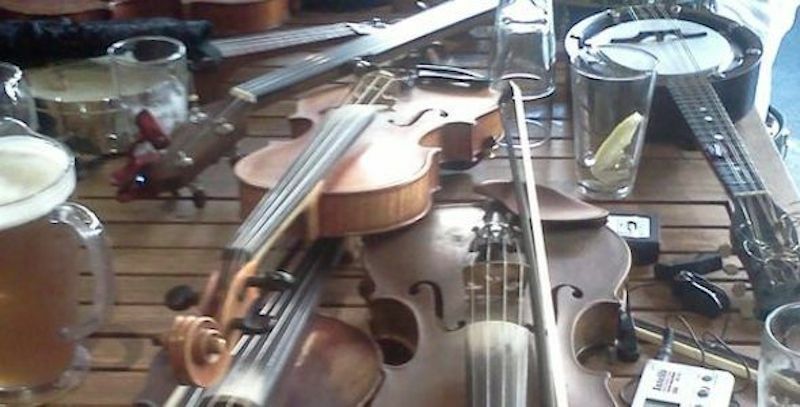 Just bring your own instrument, or just come along to enjoy the music,there is no charge. To get there exit the Caloundra turn off on the Bruce Hwy about an hour north of Brisbane.Turn right at the Nicklin Way roundabout heading to Pelican Waters and after crossing over the first bridge turn left and then left again into Nelson St. The club is fully licensed. For any further details you can contact – Terry Cook on Ph 54921727 or email – bluegrassjam@hotmail.com.